Entrepreneurial Society seems to evolve in such a way that a society of employees slowly morphs into a society of entrepreneurs. The tendency of a decrease in employment and the rise of freelancing materialized in a record of 40 percent of US workers in insecure contingent jobs in 2015 . The future of work seems to be that employment is dying altogether, but work seems to be re-inventing itself through the rise of freelancing: while corporations are laying of millions of staff they appear to be sourcing work back in from freelancers. On the one hand, the network economy can be the chance for millions to create work for themselves in a self-responsible manner; on the other hand, there is stiff competition from low wage countries on freelance platforms. Angus Deaton  argued that the latter enables developing countries to better participate in international growth. Such a profound re-composition of society, currently generating dystopian forecasts of mass unemployment and weak economies, needs to be addressed in public policies to ensure a smooth transition to this new era in order to enable economic growth while maintaining social stability. Rules and regulations have been introduced over time to ensure quality, safety and consumer protection. However, bureaucratic red tape slows down businesses dramatically. The Sharing Economy demonstrates that a lot less regulation would suffice. A middle ground between laissez-faire and the current status seems advisable for public policy along with the creation of a level playing field for all market participants. If businesses and the economy are to thrive, bureaucratic red tape needs to be dramatically curtailed – the red tape created by legislation as well as self-inflicted red tape caused by information and controlling overload within companies. There is an essential need to move from a society of control to a society of trust – not just in management, but overall. For many the only option to find work will be to become freelancers. Economies that wish to maintain a living standard that will enable growth will need to rethink their taxation and social systems. Many countries still tax people on earnings below the poverty line or even push them below the poverty line through taxation. Rather, small incomes would need to remain untouched and taxation would need to start at higher income levels. For societies this would present a far less expensive option and would ensure that people create jobs for themselves and continue working, earning their own dues without the need for government welfare programs. While insecure contingent jobs will increase further, a new social contract will be needed because existential fear will not enable economies to grow. Often SME owners and freelancers find it difficult to raise funds for their businesses or to purchase a residence: banks rate their income as too insecure. SMEs and startups may turn to crowdfunding. A recent study of crowdfunding platforms showed that their fees and conditions are costly (currently up to 14 percent for the funds received in addition to yearly dividends). Lawyers and auditing services add to these costs. Even for high risk investments this seems too expensive. If we pin our hopes on startups and SMEs to induce investment and growth, then public policies will need to address these issues. Many countries have closed their doors to platforms like Uber and Airbnb because their current legal framework is geared toward the stabilization of pricing or securing minimum standards in quality, security and income. Companies in the Sharing Economy charge an average of a 15 to 30% commission on the earnings that people make on their platform, which extracts value from the countries where the services are rendered. Should platform companies commit to setting up local branches so they can be taxed on their local profits and provide quality assurance to consumers locally? This would ensure all market participants and users of an infrastructure in a country contribute to the upkeep of those services. Education and skills gap: We need to teach the adults! The willingness to retrain and upskill will be necessary for future employability. Linear predictions of masses of unemployed people imply that people will resist learning how to do new jobs. Historic evidence demonstrates otherwise: Throughout the industrial era, people sought education whatever their role. Graduate-level education for adults should be of similar significance as educating children, as well as be affordable if we seek to qualify an existing workforce and to make knowledge operational quickly. For societies to prosper, conditions need to be rewarding for many, not just for a handful of people. In extractive societies the societal layers are impermeable; therefore, effort isn’t rewarding and so stops. 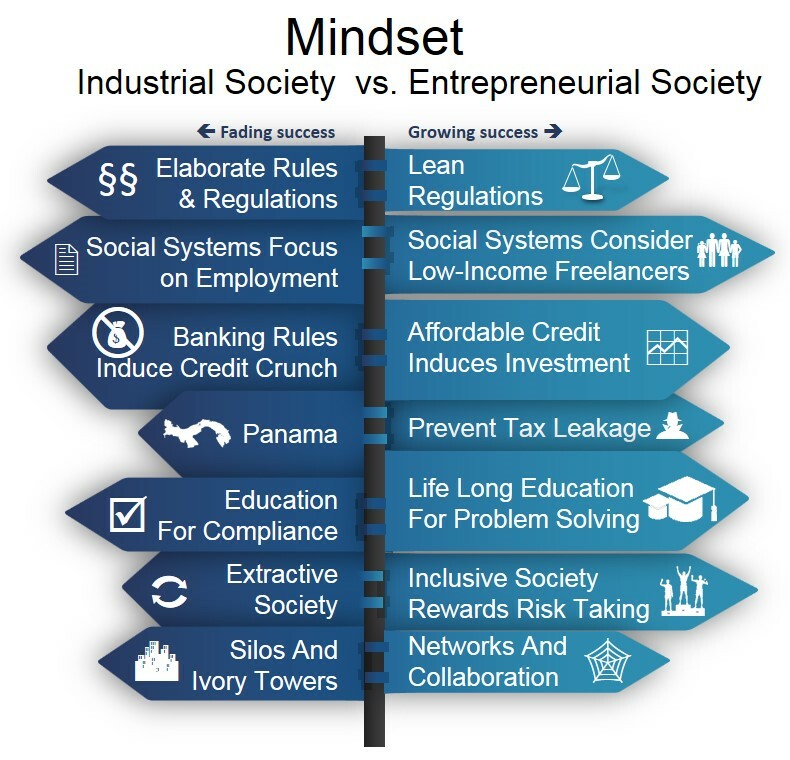 Inclusive societies that reward risk-taking and hard work have enabled economies to thrive because people were able to move upward socially . For engagement and entrepreneurship to be sustained in an economy, prospects need to be provided. In today’s highly complex and fragmented world the network is the most successful organizational form. Therefore, governments and businesses are well advised to work with and in networks. In networks, changes can be created collaboratively and will be endorsed instead of imposed. “Cooperation creates prosperity, closed systems deteriorate” is the distilled analysis of Alexander Pentland . In a networked economy it is no longer only about “competition is good for business”. Today, “cooperation is good for business“. Isabella Mader is Director of the Excellence Institute and university lecturer at several universities mainly in the fields of Knowledge Management, Information Science and IT Strategy. 2013 she was awarded “Top CIO of the Year”. Her current research focus lies with Network Economy and Collaboration. Wolfgang Müller is Deputy Chief Executive Director and Chief Operations Officer of the Vienna City Administration. He has a Masters degree in Law and a Master in Business Administration. The opinions and views expressed in this article are those of the authors, and do not necessarily reflect those of the institutions to which they are affiliated. Acemoglu, Daron; Robinson, James A.; Why Nations Fail: The Origins of Power, Prosperity, and Poverty. Crown Publishers, New York, 2012. Pentland, Alexander; Social Physics. How Good Ideas Spread – The Lessons From A New Science. The Penguin Press, New York, 2014.